When Red Cloud senior Colton ‘14 was growing up he lived out in the country, away from town in the open, short-grass prairie of Pine Ridge Reservation. On one particular day, he was walking down his dirt road enjoying the natural landscape and the big sky when he noticed something out of place—something that didn’t belong. Trash. 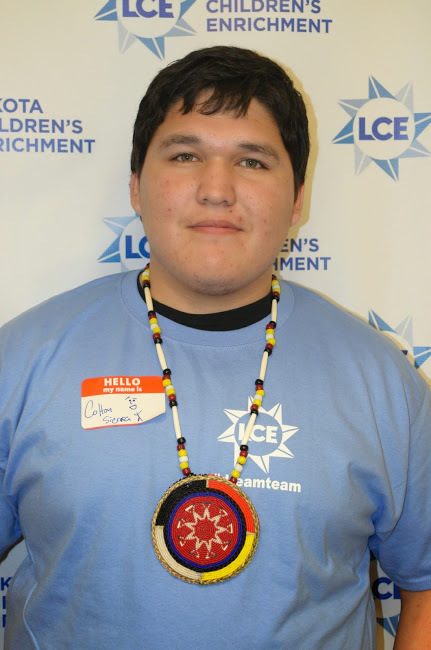 Lakota Children’s Enrichment (LCE)—a nonprofit organization that focuses on empowering Native youth and amplifying their voices—received almost 100 entries this year in its second annual Writing and Art Challenge. This year’s theme of ‘Voices of the Land’ asked students to critically think about their environment and their place in it. Red Cloud students Summer ‘17, Marcus ‘17, Derek ‘18, Payton ‘18, and Sadan ‘18 also placed as runner-ups in the competition and Jasmine Derby ‘18 was chosen as honorable mention in the art category. 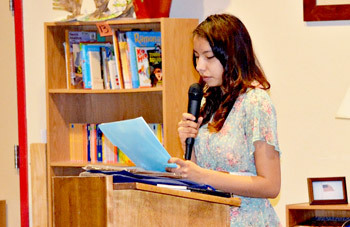 Red Cloud alumna Autumn White Eyes won the competition in the young adult category for her poem “Mitakuye Oyasin ” or “we are all related,” which reflects on her spiritual connection to the land and her experience leaving the Pine Ridge Reservation behind. Autumn, who is just about to graduate from Dartmouth College with a degree in Native American Studies, wrote the poem as her final assignment in a class on Native and Western views of nature. Colton, Autumn and all the Red Cloud students who entered the competition were honored at an awards ceremony at Red Cloud on Friday, April 11. A number of the renowned judges, including Jody Williams, who was awarded the Nobel Peace Prize for her activism against the use of landmines, and Jasmine Mans, an up-and-coming poet and spoken word artist, were on hand to congratulate students and encourage them to keep writing. The award ceremonies at Red Cloud kicked off the Lakota Children’s Enrichment’ Global Youth Service Day festivities, a three-day celebration that culminated on Saturday, April 12 with a Youth Summit at the SuAnne Big Crow Boys & Girls Club in Pine Ridge.